"The longer I stayed in [the Air Force] and the higher I ranked - the more I looked around the table, and there were less and less people who looked like me..."
Retired U.S. Air Force Col. Lisa Carrington Firmin ’79 has never backed down from a challenge. Being the first in her family to navigate the territory of college and receive her degree at Texas A&I University, she admits that she had an inherent desire, from as early on as she can remember, to not just leave her footprint on this world but to make a true impact on the lives of others. That promise and motivation was felt in the depth of her bones as she raised her right hand and repeated the officer’s oath, commissioning as a second lieutenant in the Air Force. She wasn’t focused on the shade of her skin as she lifted that hand in promise to her country, agreeing to defend it at all cost and to lead those under her charge honorably. But as she immersed herself into her new career, day-by-day, it quickly became apparent that Col. Carrington Firmin’s gender and Hispanic ethnicity were going to be the ammunition she’d sometimes battle the hardest against. So where did the compulsion originate for her to do what was not ordinary? It all stems from an overwhelming reverence for her father. Growing up during his military career and observing the sacrifices he made and the courage it took to lead that life, Col. Carrington Firmin embraced his mentality that service to others held vital purpose. “Because my father had a medical retirement and was 100 percent disabled, the government paid for my degree, and I felt an obligation to that. I also wanted to join the military because I wanted to follow in my father’s footsteps,” she explained. Those insults just set fuel to her fire, as she exclaimed, “You don’t say that to a Latina! To a Javelina! We’ll just dig in!” She culminates that all-consuming, burning desire to do something meaningful with her life – despite the insurmountable odds – into one word proudly drawn from her Hispanic heritage: Ganas. In a time when women in combat were touted as a hindrance, she drew upon that ganas as she was flown into Iraq in 2004 at the dead of night, rushing off a C-130 Hercules Engine Running Onload/Offload Operations due to the prevalence of attacks in the area. She was the commander of the 332d Expeditionary Mission Support Group, 332d Air Expeditionary Wing, deployed to Balad Air Base, also known as Camp LSA Anaconda. It laid in the middle of almost unsurmountable enemy hostility. Her mission? To build and secure Camp Anaconda so that it could eventually become the largest strategic airlift hub for the U.S. troops in the war effort. Although what she witnessed and endured while deployed is unconceivable and hard to put into words – the Air Force did, by awarding her a Bronze Star. The award further details, “She expertly led over 725 expeditionary combat support personnel in bedding down seven Joint and Air Force missions valued at over 760 million dollars in less than ninety days. Colonel Firmin’s warrior focus and tireless efforts drove the movement of over 39,000 tons of cargo, 68,000 troops on over 4,300 missions contributing to the largest rotation of forces in United States history…” Underestimated no more. Col. Carrington Firmin also saw the reward of her persistence when toward the end of her military career, she found herself back at that first duty station – but this time, she was in charge. “I got reassigned to that first base and military assignment of mine 20-something years later, as a full colonel, as the support group commander of the base – I mean everything was my responsibility, from the roads to the child daycare center, to maintaining infrastructure like the flight line, fuels, transportation, supply, the cops on base … so going back as a colonel was so much better than being a second lieutenant,” she quipped. That education was so pivotal for Col. Carrington Firmin in her life that she felt honored to see her son, Evan Firmin ’09, follow in her footsteps, just as she had done with her own father. In fact, when Firmin graduated from A&M-Kingsville, he wore Col. Carrington Firmin’s exact graduation robe as he walked across the stage to become a Javelina –sleeves too short and all. Col. Carrington Firmin doesn’t disregard the fact that her opportunity to raise a son while maintaining her military career – an opportunity not many woman were allowed in the service – is another blessing she treasures. Instinctively, Col. Carrington Firmin wishes to encourage and empower other students at Texas A&M University-Kingsville to believe in the capability of their education as well. For this reason, she created a scholarship intended to help a first-generation student with a military affiliation attend A&M-Kingsville. And her commitment to others doesn’t end there. After she hung up her uniform, Col. Carrington Firmin began working with the University of Texas at San Antonio to build diversity and improve their student body. 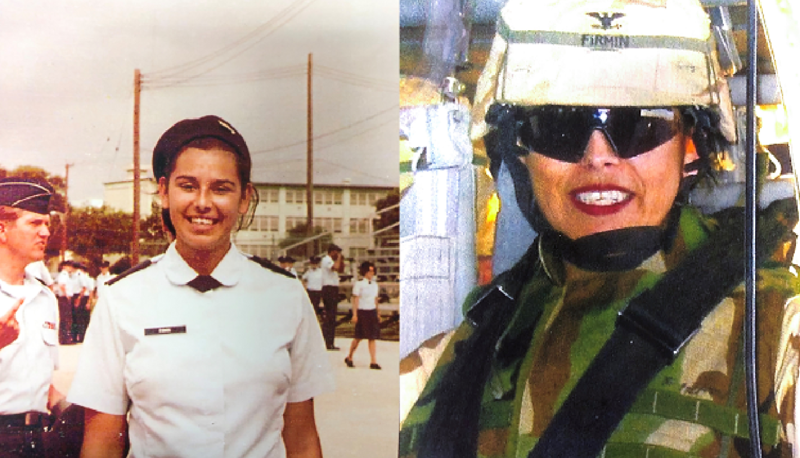 Her success in that position eventually led to her being asked to serve as the associate vice president and UTSA military liaison for the Office of Veteran and Military Affairs. As such, Col. Carrington Firmin avidly provides mentorship and serves as an advocate for students with military affiliation. Her sense of service has only heightened in the civilian world, and despite the numerous awards and titles she could boast, above all else, she regards herself as a proud mother, grandmother and veteran. To learn more about and apply for Col. Lisa Carrington Firmin's scholarship for first-generation and military affiliated students at Texas A&M University-Kingsville, please click here. Inspired to contribute to the Colonel Lisa Carrington Firmin Scholarship? Please click here.